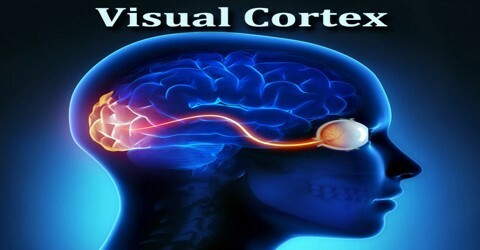 Visual Cortex is the part of the cerebral cortex that receives and processes sensory nerve impulses from the eyes; it is also called visual area. It is located in the occipital lobe in the back of the skull. Primary visual cortex is the site of a remarkable transformation in the neural representation of the visual world. The afferent neurons of the retina and the primary visual thalamus, which relays the retinal signals to the primary visual cortex, have circularly symmetric receptive fields and respond to almost any stimulus, as long as the stimulus falls within a broad range of sizes. The receptive field is the region within the entire visual field that elicits an action potential. But, for any given neuron, it may respond best to a subset of stimuli within its receptive field. Primary visual cortex has become a model system for neuronal processing by the circuitry of the cerebral cortex. In the higher visual areas, neurons have complex tuning. For example, in the inferior temporal cortex (IT), a neuron may fire only when a certain face appears in its receptive field. Primary visual cortex is divided into six functionally distinct layers, labeled 1 to 6. Layer 4, which receives most visual input from the lateral geniculate nucleus (LGN), is further divided into 4 layers, labelled 4A, 4B, 4Cα, and 4Cβ. Sublamina 4Cα receives most magnocellular input from the LGN, while layer 4Cβ receives input from parvocellular pathways. 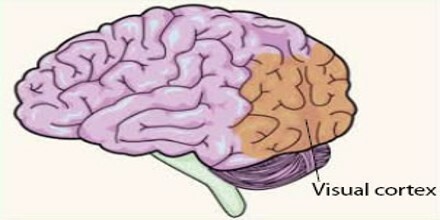 The visual information from the eyes is organized into the optic nerves which go to the optic chiasm where it splits into pathways containing vision from the left side of our visual space (or left visual fields) to the right side of the brain, and information from the right visual fields goes to the left side of the brain. Then these bundles of nerve mostly go to the lateral geniculate bodies, where they synapse with other neves, there’s some organization and processing of the information and that information is sent along the optic radiations to the occipital cortex. Visual information is also sent along the optic tracts to the superior colliculus also known as the optic tectum. That seems to have more to do with directing visual attention and fast responses to visual information, not so much cognitive responses to visual information. Primary Visual Cortex (V1): The tuning properties of primary visual cortex (or V1) neurons differ greatly over time. Early in time (40 ms and further) individual V1 neurons have strong tuning to a small set of stimuli. That is, the neuronal responses can discriminate small changes in visual orientations, spatial frequencies and colors. The functionally defined primary visual cortex is approximately equivalent to the anatomically defined striate cortex. Secondary Visual Cortex (V2): It is the second major area in the visual cortex, and the first region within the visual association area. It is argued that the entire ventral visual-to-hippocampal stream is important for visual memory. Third Visual Complex (V3): The “complex” nomenclature is justified by the fact that some controversy still exists regarding the exact extent of area V3, with some researchers proposing that the cortex located in front of V2 may include two or three functional subdivisions. 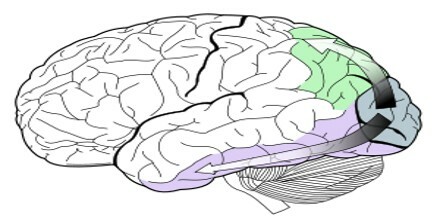 Visual Area V4: V4 is the third cortical area in the ventral stream, receiving strong feedforward input from V2 and sending strong connections to the PIT. It also receives direct input from V1, especially for central space. 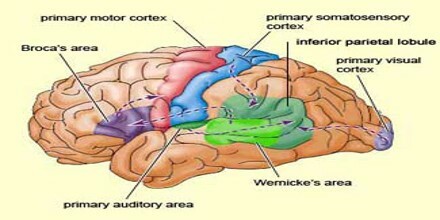 It is one of the visual areas in the extrastriate visual cortex. Visual Area V5 (or MT): Middle temporal visual area MT or V5 is connected to a wide array of cortical and subcortical brain areas. Its input comes from visual cortical areas V1, V2 and dorsal V3 (dorsomedial area), the koniocellular regions of the LGN, and the inferior pulvinar. The pattern of projections to MT changes somewhat between the representations of the foveal and peripheral visual fields, with the latter receiving inputs from areas located in the midline cortex and retrosplenial region. It was shown to be organized in direction columns. DeAngelis argued that MT neurons were also organized based on their tuning for binocular disparity. Dorsomedial Area (DM or V6): It is a subdivision of the visual cortex of primates first described by John Allman and Jon Kaas in 1975. V6 is located in the dorsal part of the extrastriate cortex, near the deep groove through the centre of the brain (medial longitudinal fissure), and typically also includes portions of the medial cortex, such as the parieto-occipital sulcus. It is also sometimes referred to as the parieto-occipital area (PO), although the correspondence is not exact.